"Rosemarie Myrdal at her House Desk"
Photograph of North Dakota House Representative Rosemarie Myrdal sitting behind her desk at the Legislature. An unidentified woman is standing to her right. 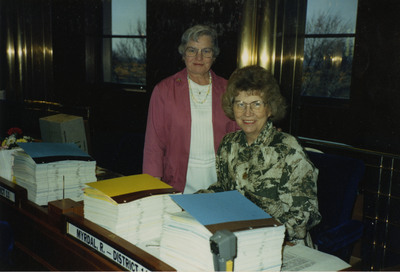 A Republican from Edinburg, Rosemarie Myrdal represented District 11 (Pembina and Walsh counties) in the ND House from 1985 until 1993 and served as the Lieutenant Governor of ND from 1993 to 2001.